For Juliana and Benjamin Yeager, real estate comes naturally – and the proof is in their many accolades. 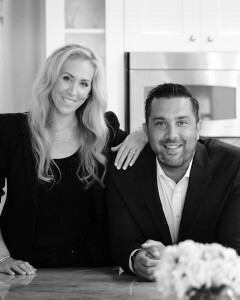 Since joining forces more than a decade ago, the husband and wife team have established themselves as industry leaders who are continually ranked among the top 1% of Chicago REALTORS®. Together Juliana and Benjamin offer a client-centric approach that is rooted in building trust and lasting relationships. This has resulted in countless referrals from loyal clients who consistently praise The Yeager Team's negotiating skills, marketing strategies and attentiveness to their best interests. Beyond their wide range of professional expertise, Juliana and Benjamin offer complementary skills that set their business and their clients apart from the crowd. With a keen eye for design and the trades available to make quick fixes, the Yeager Team has the knowledge and resources to not only sell a home for top dollar, but also spot ways to improve an investment and help a buyer truly make a home their home. Working with both buyers and sellers regularly also gives the Yeagers the inside track on how people think and react when buying or selling a home. No matter the client, the Yeagers lend their guidance and expertise at every stage of the transaction to ensure the process is smooth and successful. Both proud Chicagoans, Juliana and Benjamin reside in the Lakeview neighborhood with their three children. Their experience living and raising a family in the city offers their clients a plethora of first-hand knowledge when it comes to schools, local parks, community organizations, business recommendations and everything in between. While trust is hard to come by in today's fiercely competitive real estate market, The Yeager Team provides the professionalism and integrity needed to ensure you feel secure throughout one of the biggest decisions of your life. "Ben was fantastic! I was a first-time home-buyer, so I had a lot to learn and took a while to make an offer. Ben was never impatient or pushy, and always took the time to teach me everything I needed to know to make the right purchase. He has the expertise and the right attitude to make anyone's home search an enjoyable experience!" "I worked with Benjamin for almost two years looking for my new home. He was readily available to look at places & always accommodating with my unusual schedule. He was honest and upfront about his thoughts on the various places I considered. Benjamin made this long, challenging process much easier and more pleasant than it could have been. I will definitely be using him in the future and would recommend him to anyone without any hesitation." "The service provided by Benjamin and Juliana was first class! Very professional approach with a strong personal touch. Would highly recommend the Yeager's for any real estate transaction."